Aki is concentrating on her art work. 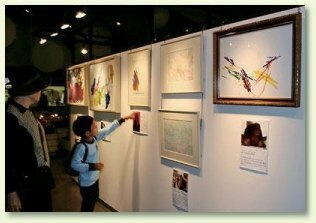 In November Golden Year 3 (2006), an exhibition of paintings by anthropoids was held at Nagoya Higashiyama Zoo, Japan. These works of art were created by chimpanzees, gorillas and orangutans in Japan and foreign countries. 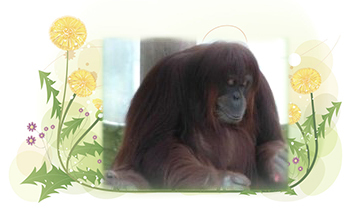 In the Higashiyama Zoo there is an orangutan called Aki, and her paintings attracted the most attention. Aki first gave birth last year in March, when she was twenty-two years old. However, the baby died twelve days after the birth. After the death, Aki remained crouched down on the spot, depressed and hugging the baby for four days without eating anything. When the animal handler saw that, he wanted to help her to overcome her sadness; he gave Aki crayons and drawing paper. Since then, Aki started drawing. Aki holds the crayon or pen in her hand and has drawn on a number of sheets of paper every month. By doing that, she has become happy. Since then, she has painted thirty pieces. According to the animal handler, Aki likes to use red, black and green to draw lines on full sheets of paper to make it colorful. The visitors at the exhibition were surprised at how fantastic, colorful and powerful the paintings were. They couldn’t believe that these paintings were created by anthropoids.